I think that not everybody likes wine from shops, either because of its price or of anything else. And if we take into account that in small doses this beverage is even health-giving, it becomes obvious why I became interested in homemade winemaking. I want to share my experience with you. 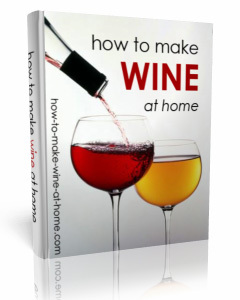 If you want to become a real professional and to know how to make wine at home, you can read the book "How to make wine". Having read this wine book, you will learn to make wine of any taste, either berry wine or fruit wine, or yet some other. The raw material for the winemaking (berries for berry wine or fruit for fruit wine) must be ripe and clean. Firstly you needed to get the juice, thus you ground down and squash the raw stuff. It is better to do this in the day of their harvesting or on the next day, for them not to rot. Try to avoid metallic instruments and tableware as much as possible. The got mass is called septum. You should leave it in this state for a day, for the fermentation process to begin. After that, septum is wrung out by means of gauze or simple with a clean fabric to get whole juice. The next process is a preparation of wort. In whole juice of fruit and berries, as a rule, there is too a small amount of sugar and too much acid. According to their content you need to add sugar and water. Proportions are an object for experiments. The potency of the future wine and its taste depend on the amount of added sugar. Too small content of acid will result in spoilage of the beverage; too much acid influences the taste. For example, for a liter of red currant juice I take 2 liters of water and 1 kg of sugar. For a liter of cherry juice I take 0.5 liter of water and 0.3 kg of sugar. I should remind that further taste of homemade wine depends on quality of the added water. It is also important to know that there is special wine yeast, which improves the wine. Vessels for fermentation must be wooden or glass. They are filled up with wort not up to the top, because it usually increases in its volume. You can add a few raisins in it. This will speed up the beginning of process. A fermenting vessel should be densely closed with a lid. Then insert in it a plastic or rubber tube (from a medicine dropper, for example). The other end of the tube is inserted in a bottle with water. It is better to seal a cork with beeswax, so that air from a fermenting vessel could go out only through a tube. All this is done in order that air did not have an access to wort. If you do not follow this rule, the vinegar fermentation will start now and we will get in result not a homemade wine, but a good sample of vinegar. In the fermentation process sugar from wort turns into alcohol and carbon dioxide, the latter rises to the lid and through a tube goes out in water, and then in atmosphere. At that time water prevents air penetration through a tube. The signs of fermentation will appear not immediately, but gradually all the greater number of carbon dioxide bubbles and �boiling� will mean that the first stage of the fermentation process began � the active one. The temperature in the room must be 20�30 degrees, the fermentation lasts usually for 3�4 weeks. The volume of wort is at this time increases, abundant foam appears on its surface. When the isolation of carbon dioxide considerably diminishes and sediment falls on the bottom of vessel � we understand that the first stage of fermentation is finished. Now you need to separate wort and sediment, which consists of dead yeast and other products of decay. Pour it by a siphon, i.e. a usual plastic or rubber tube which is inserted in wort by the one end. Draw the air in through the second end so that the wort began to flow, and thus pour it in some clean tableware. Try not to disturb the sediment. New vessel is closed the same impermeably as the previous one, the tube is set in water. The second stage is a quiet fermentation. It passes 1�2 months, while the gas bubbles almost fully halt, and new sediment falls again. After it, pour out this homemade wine for the second time. Then the vessel with wine is closed densely again, sealed with a beeswax. This time you do not set the tube. Wine slowly continues to ferment, matures and performs some chemical transformations. The wine storage takes place at a temperature of 10�15 degrees, wine matures no less than 6�8 months, whereupon it is poured into bottles, densely corked up and kept in a cool place or in the special wine cellar. With the flow of time the qualities of any wine improve, but each sort has own limits. Vermouth (aromatized) � this wine is made by adding vodka tincture with herbs. When you succeed in making homemade wine, letting it mature and showing self-control while waiting of the result � trust me, you will not be disappointed. Herein you can get some assistance of the wine book "How to make wine at home", which contains more that 90 homemade wine recipes.